Exhaust gases from a prime mover can be used to generate either low or in some applications high-pressure steam. With an engine based CHP system, the jacket cooling water is routed through an exhaust heat recovery unit producing low-pressure steam. Heat in the engine jacket coolant accounts for up to 30 percent of the energy input and is capable of producing 200 to 210°F hot water. Some engines, such as those with high pressure or ebullient cooling systems, can operate with water jacket temperatures up to 265°F. Engine exhaust heat represents from 30 to 50 percent of the available waste heat. Exhaust temperatures of 850 to 1200°F are typical. 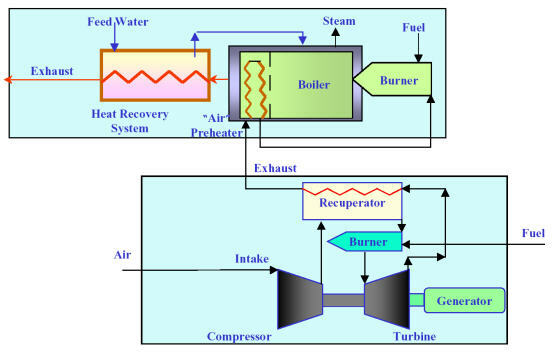 By recovering heat in the engine cooling systems and exhaust, approximately 70 to 80 percent of the fuel’s energy can be effectively utilized to produce both power and useful thermal energy. A HRSG is a steam boiler that uses hot exhaust gases from the gas turbines or reciprocating engine to heat up water and generate steam. 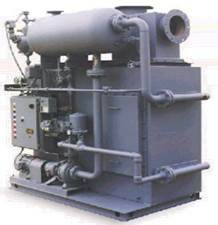 The steam, in turn, drives a steam turbine or is used in commercial applications that require heat. Exhaust gas velocity is limited by the need to keep head losses down which requires a larger heating surface area. Other technologies for hot heat recovery can be found in our CHP Applications Guide.